So this week has been non-stop for me. I had some family in town over the weekend, and lots and lots of work to do at the office. With Daniel still slacking off in Florida I didn’t want to leave you guys hanging so I am putting together a nice little Quick Draw for you. This time I will be concentrating on two blends that I wasn’t sure if I was going to review. I figured I might as well drop them in a quick draw and cover the basics. 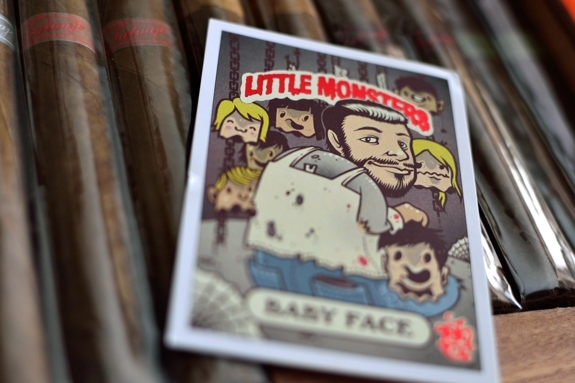 I’ll be taking a look at the Mini-Mum and the Frank Jr. From Tatuaje’s Little Monsters series. 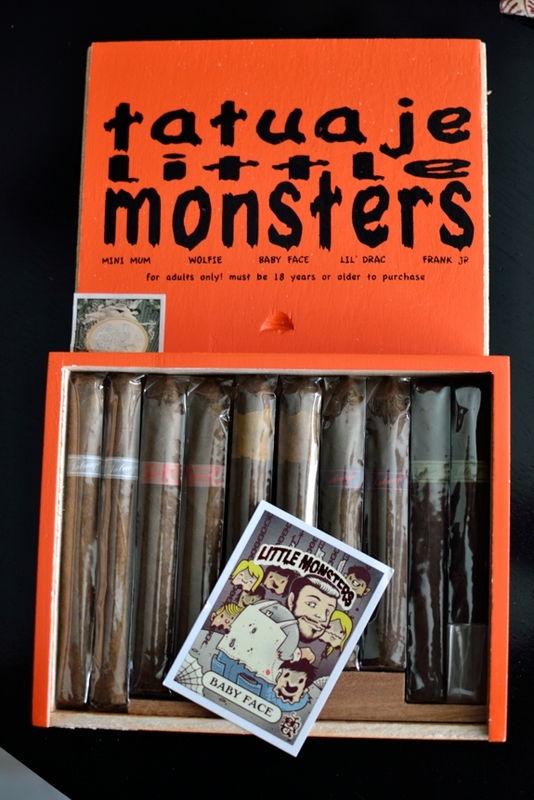 The Little Monster Series is basically I re-release in mini-format of all the monster series cigar from Tatuaje to date, with the exception of the Little Boris (this was actually released as a region release, shop specific) and the new blend to look for this Halloweeen, the Mummy. What these cigars lack in size they make up for in flavor. The box of 10 include 2 of each: The Mini-Mum, The Frank Jr, The Lil’ Drac, Baby Face, and the Wolfie. Along with the cigars some of the boxes (from my understanding they actually ran out of these at some point) contain a fun little random collectors card. Each collectors card had one of the 5 cigar’s character drawing and information on it. Even further stretching “limited edition” a few of the “Baby Face” cards actually had Pete Johnson in the place of baby face. These cards aren’t really worth anything, but they were a fun edition to the box. Anyways, these limited edition cigars will run you $75 a box with only 10,000 boxes made. Ever since the let down that was the “Tatuaje Frank” I have been incredibly eager to try this blend. the Frank was coined by many as Pete’s finest cigar ever made. I only had the pleasure of smoking one, not long ago, that had aged way past it’s prime. It was just kind of boring. You can check the Quick Draw I did on that one here. How did the Frank Jr. Stand up? For lack of better words, it was awesome. I’ll start with the format. I liked this size so much more than the huge, bulky frank. The best part was the elongated box-press. I love those. Perfect draw every time while it sits perfectly and comfortably in your hand. I said it before and I will say it again, I am a sucker for Connecticut Broadleaf and the Frank Jr. is the epitome of how beautiful that wrapper can look. Cutting and lighting the Frank Jr. was cake. The flavors were just intense, much unlike the Frank that fell flat the Frank Jr. delivered with some powerful cocoa, vanilla, cherry, cinnamon and black pepper right off the bat. As expected, the pepper faded pretty quickly and the sweetness began to set in. The flavors remained very bold witth little change up until an all around creaminess took over toward the end of the smoke. The burn line was perfect the entire time with no-touch up or relights. This is a cigar that I really wish would find it’s way to full release. This size too, not the bigger brother. I’d eat through boxes of these if I had the chance and I am sure I can speak for some of you in saying you would too. Next one the chopping block is the mini-mum. I was a bit skeptical on this release due to hearing both good and bad things about it. One of my good friend’s Dan Reeve over at CigarExplorer.com hyped this cigar up to me. I know Dan well, and I know that we both know each other’s pallets well enough to speak for each other and he kept boasting about this cigar to me. Needless to say, it was the first one that I smoked as soon as I got the box. First off, this is a pretty cigar. Not in terms of “perfect” cause let’s face it, the wrapper is ugly. But you know what? That’s what I look for in a cigar. I don’t want a pretty, consistently dyed wrapper. I want something firm, well constructed, and natural. That’s exactly what you get in the case of the mini-mum. The Nicaraguan Sun Grown Criollo is a beautiful splotchy light/dark brown with orange mixed in. It gives off a TON of strong, sweet tobacco and cedar aroma. But enough about the wrapper let’s get into the flavor. This cigar was another flavor powerhouse pouring out tons of cedar, spice, nutmeg, cashew, leather, sweet tobacco and even a bit of fruit. Yeah, it’s a lot of flavor but the Mini Mum ties it all in perfectly with a smooth and creamy experience from start to last. The burn line was a bit wavy but again, no touch ups or relights required. 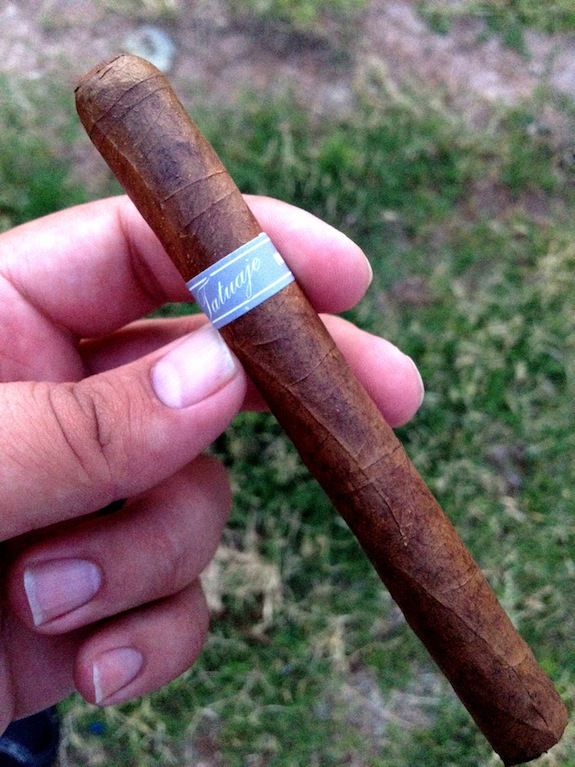 The entire time I smoked this cigar I couldn’t help but compare it to the Tatuaje Black. It was everything I liked about the black blend, only better. That being said, I really can’t wait for the full Mummy release to come. These will be a monster series blend that I will be going after. Gotta keep this baby a float! hahaha nah man, Daniel deserved the rest. Thanks man. I think these will probably be the only ones I’ll quick draw on. Unless there is something crazy with the other blends, but I think all those are pretty straight forward. Glad to see a post this week, with you being so busy. I guess after reading this and other reivews, I may just have to track down a box sometime. Tony, I’m finally getting to try this one due to the generosity of Paul @smokedthatcigar.com, who gifted me a flight of Little Monsters just before Christmas. Your review is spot on, tons of cedar, tobacco, and sweet powdery spice, producing a boatload of smoke with little effort. Absolutely love the size, too. Good review Tony, enjoyed it, I’m sure Daniel will do the same some day for you. You both do a great job! Thanks man! I know he’d do the same for me in a heartbeat. Daniel is really good people. nice review, gotta get these for my humi!! Get them while you can, they are selling out fast! You’re doing a great job Tony!! As Daniel winds up his first trimester of honeymoon vacation time, it’s great to see the American picking up the slack for him. hee hee !! I love the idea of these multi blends boxes. The variety and sizes and you don’t have to commit to an entire box. I have to find a way to get a box up here. It’s a holiday Monday in Canada today, so everyone just relax and have a smoke, eh? Another Holiday? Dang, no wonder why Daniel can go MIA for a month and no one will notice. Smoking the Frank Jr now. Got 3 boxes and this is my first crack at any of em. Just a great start. Nice snug draw with tons of smoke!